When Robert Millar came to Spain in April of 1985, as team-leader of French Peugeot, he was still on a high after winning the King of the Mountains prize in the previous year's Tour de France, the only Britain to ever do so. A prickly character, the Scot didn't court journalists, who found him rude and monosyllabic. Yet he was impeccably professional, earning respect in the peloton and among team-mates. In Spain, this diminutive and sharp-faced cyclist cut a somewhat peculiar figure, with his pierced ear, long hair and vegetarian diet. He complained about the stir his ear-ring caused, but it must have been a rather gratifying confirmation of his unconventionality. The Vuelta had never been so international as it was in 1985. President Ronald Reagan might have been living out his Star Wars fantasy, but Unipublic had no time for the Cold War, and booked into the same Valladolid hotel were the amateur squad Union Sovietica and the American Xerox-Philadelphia, directed by Robin Morton - a woman, what ever next? But the team arousing the most fascination was the Colombian Varta, with their numerous entourage and 200 kilos of panelas - sweets made of sugar cane juice, which the escarabajos (or beetles, as the small Colombian climbers were nicknamed) ate to fuel their attacks in the mountains. They'd chosen a good year for their Vuelta debut since there were four summit finishes and of the 37 puertos, ten were first-category. And to keep Colombia up-to-date on her heroes' exploits, two radio stations - Radio Caracol and Radio Nacional de Colombia - competed with ever more feverish commentary. The home favourite was Pedro Delgado, who'd been lured away from Reynolds by OrbeaÐSeat with the biggest contract in the history of Spanish cycling, as the Press never tired of repeating. He and team-mate Pello Ruiz Cabestany, recent winner of the Basque Country Tour and ex-Basque Nordic Ski champion, were hogging all the limelight. They represented a new breed of Spanish cyclist: cheerfully ambitious and self-assured, neither took up cycling to escape poverty or for lack of other opportunities. Some old-school directors viewed them with suspicion as over-educated and overpaid. Kas reappeared in the '85 peloton, now registered in France and led by Sean Kelly, with Caritoux by his side. There was also the 'best team in the world', Panasonic, directed by Peter Post. Not unexpectedly, it was their leader, Bert Oosterbosch, who won the prologue in Valladolid. Rather more surprising was the young unknown who finished second that day: 20-year-old Miguel Indurain of Reynolds. The first week was tumultuous. Strong winds, rain and an unwieldy peloton filled with novices made a recipe for tension and crashes, the fourth stage in Galicia being particularly hectic. A sheep dog invaded the peloton and left two cyclists seriously injured. Then, the labyrinthine route through La Coruna tied the race into knots, when for a while the broom wagon was at the head and support cars were driving off in the opposite direction. At the finish in Lugo, as Eddy Planckaert celebrated his second sprint victory, two other Belgians sorted out a private dispute in a fist fight. The first real test came on stage 6, when the peloton had to confront the Covadonga climb. Lucho Herrera, Varta's leader, attacked first and created a select group up front, including his team-mate Fabio Parra, Zor's Colombian leader Pacho Rodr’guez, Orbea's Pedro Delgado and Pello Ruiz Cabestany, and Robert Millar. The Scot was next to accelerate, and he maintained his pace without looking back, the others on his wheel. Delgado waited for the final kilometre to strike, and when he did, no one could follow. In the very place where the previous year he'd lost the yellow jersey he became the new race leader. In the overall, his team-mate Ruiz Cabestany was seven seconds back and Millar was third at 13 seconds. The casualties of the day were Indurain, who lost 13 minutes, and Sean Kelly nearly four minutes. There was another summit finish on the following stage in the Alto de Campoo ski station in Cantabria. Sean Kelly, out to retrieve his losses on the steep gradients of Covadonga, knew his only chance was to escape early on and tackle the two final first-category climbs ahead of the peloton. So he attacked on the descent of La Carmona on the Asturian-Cantabrian border, but luck deserted him as he punctured at the foot of the woody Puerto de Palombera. It was here that the Colombian Varta team put their plan into action. They sent one rider on the attack to break up the peloton, and created a small leading group of Millar, Pacho Rodriguez, and Ruiz Cabestany - a trio who would become well acquainted with each other in the next couple of weeks - as well as their own Jose-Antonio 'Tomate' Agudelo. 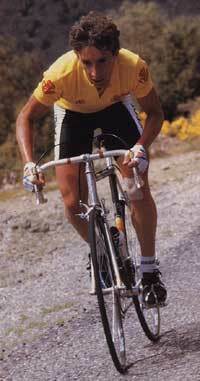 Ruiz Cabestany was not an outstanding climber - his strength was against the clock - but he kept his head and a steady rhythm. On the final climb, as in Covadonga, Millar made constant accelerations, but his adversaries were able to match every one. Then, a kilometre from the top, Agudelo pounced with a successful bid for the stage. 'El Tomate wins. El Tomate wins,' intoned the Colombian broadcasters, over and over, in an ecstatic trance. On the ninth stage Ruiz Cabestany knew everyone's eyes were on him, waiting to see if he'd crack on the slopes leading to the Pyrenean spa of Panticosa. Varta's Fabio Parra had attacked, but the situation was under control. Ruiz Cabestany and Delgado had Millar under close surveillance, as the three rode together in the final kilometres. The Basque could feel satisfied with his performance - he was resisting well. Then, to his consternation, Pedro Delgado jumped without any warning, and disappeared up the road in search of the Colombian. Ruiz Cabestany was suddenly left alone with Millar, who didn't hesitate to follow Delgado's example. Fuelled by indignation, the Basque was not only strong enough to stay with Millar but, in a burst of rage, overtook him on the line. The two Orbea men had a heated row. Fabio Parra had won the stage, and Delgado had put the yellow jersey in danger. For what? A few paltry seconds. The truth was that Perico had been unable to contain his anxiety to win back lost time. He was furious with himself for having cracked the previous day, and his notorious salary made him an easy object of taunts. Txomin Perurena, Orbea's director, held a team meeting to restore harmony, but in any case, circumstances would soon oblige them to put aside their differences. Stage 10 was in the lower reaches of the Pyrenees, from Sabinanigo to Tremp, the kind of hard day of constant small climbs that made Sean Kelly rub his hands with anticipation. Colombian Martin Ramirez was first to stir up hostilities, rapidly joined by Kelly, Millar, Pacho Rodr’guez, Alvaro Pino, the Russian Ivan Ivanov and Fabio Parra. Stranded behind, Orbea's Dynamic Duo spent a grim day chasing, and with Fagor's help, were able to limit their losses to half a minute. Kelly, in his element, won the stage, having taken the longest stints on the front, though he had plenty of collaboration from Millar, who was riding into the yellow jersey. Ruiz Cabestany dropped to second overall at 24 seconds and Pacho Rodr’guez was third at 37 seconds. The toughness of this Vuelta had defeated the Americans, who'd all given up and gone home. Not so the Soviets, whose team remained intact. Their director Gamady Godunov explained how they functioned: 'In my country professional sport doesn't exist. The State gives us the clothes, bikes and everything we need, but we don't get paid. They only give us what we lose at work when we go to compete.' The team included a railway engineer, PE teacher, soldier and lathe operator. Godunov was angry that he hadn't been sent a route book. If he'd known it was going to be such a mountainous race, he would have brought climbers rather than roadmen. As the peloton rode into Andorra, there was no respite. 'It seemed more like a motorbike race than a cycle race,' wrote El Pa’s. Unable to hold the fierce pace, Sean Kelly was dropped on the first-category Alto de Canto, and the Orbea pair launched another attack on the six-kilometre drop to the finish, and won back 14 seconds from Millar. After risking their necks, descending fearlessly at speeds of up to 90kph, it seemed like scant reward, but with the overall so tight, every second was crucial: Ruiz Cabestany was now only ten seconds behind the Scot. The stage-winner was Pacho Rodriguez, and while he was still trying to recover - 'The descent was terrifying,' he gasped, wide-eyed - the Colombian broadcasters hustled him away. They'd set up a connection with his wife back home, so she could congratulate him live on air for maximum emotional impact. The position at the top of the general classification changed significantly the following day, when the Vuelta's visit to Andorra was completed by a cronoescalada to the ski station in Pal. Pacho Rodriguez won, despite losing precious seconds by mistakenly switching to the big chain-ring just as he began the hardest final five kilometres. Millar had the second-best time, only ten seconds slower, but Ruiz Cabestany lost a hefty 1'-58" - a hard blow to his morale. When people remember the 1985 Vuelta, inevitably there is talk of team alliances, as these played such a big role in the outcome of the race. But pacts and coalitions are all part of a day's work in cycling, and as a reaction to the particularly fratricidal '84 season, there was now a certain reticence among the Spanish team directors to work against each other unless they had a very good reason. For instance, on one of the early stages, when Juan Fernandez of Zor escaped, Reynolds, with Indurain in yellow, did not chase. Afterwards, Ech‡varri wanted to stress that it was 'so no one could accuse us of attacking a Spaniard'. Hardly a day could pass without some kind of pact. Among the Colombians, there was no doubt about their priorities: when Lucho Herrera abandoned with tendinitis, Varta immediately placed themselves at the disposition of Zor's Pacho Rodriguez, in the interests of national honour. On stage 14, the French teams also showed they could unite forces if it suited them. As the peloton skimmed southwards along the Mediterranean, Peugeot and Skil-Kas took full advantage of the cross-winds, working together to form an echelon. Pacho Rodriguez and Perico Delgado found themselves on the wrong side of the gap, which started to grow alarmingly. Varta were of little use on the flat, so Zor's Javier Minguez drove nervously back and forth, talking to other directors, looking for help. Kelme agreed to collaborate, and then Teka joined in when their leader Raimund Dietzen punctured. Much hard grafting later, the peloton was compact once more, and Kelme got their reward when Jose Recio jumped 78 kilometres from the finish in Benidorm and won, with nearly six minutes on the bunch. Another alliance was born out of Fagor's disappointing performance. Out of contention in the overall classification, all the team could hope for was a stage-win. So before the Albacete to Alcala de Henares stage, expected to be windy, their director, Luis Ocana, approached Orbea with a plan. At a feeding station, six members of Fagor attacked, accompanied by Ruiz Cabestany and Delgado, as well as two Soviets. Zor and Peugeot had to chase for all they were worth during 75 kilometres before the battle finally came to an end. The surprise ambush had failed and Kelly won the bunch sprint. Quite clearly, alliances are woven into the fabric of any race; they are the norm rather than the exception. When it came to the final time-trial, Robert Millar had been in yellow for seven days, and among riders and directors he was the favourite to win the Vuelta. A prominent banner at the roadside read: 'Espanoles, valientes, Que no gane El Pendientes' ('Brave Spaniards, don't let the one with the ear-ring win'). But few believed Ruiz Cabestany could recuperate so much lost time, so it would be between a Scot and a Colombian. Peugeot clearly hadn't taken Millar too seriously, for they had to send over a time-trialing bike a la Moser at the last minute. It was a nervous afternoon for all the top contenders, with punctures and bike changes galore. Ruiz Cabestany won, gaining 37 seconds on Pacho Rodriguez and 40 seconds on Millar, which left the overall with the Colombian ten seconds adrift of Millar and the Basque third at 1'-15". As far as the Scot was concerned, that was it. 'The Vuelta's over. I've won,' he claimed. Millar had suffered more than he expected to in the time-trial and perhaps it was relief that made him speak so bluntly. He wasn't afraid of the penultimate Segovia stage, with its three puertos - Morcuera, Cotos and Los Leones. With the last one 43 kilometres from the finish, a successful attack seemed unlikely. 'I just have to stick to Pacho Rodriguez's wheel and it's done.' But Pacho, cursing the 24 seconds he'd lost by crashing in Compostela, was not going to surrender to a difference of 10 seconds. 'I'll fight to the last moment,' he vowed, 'because you should never give up hope.' Perurena, Orbea's director, hadn't lost faith either, instructing his riders to attack Millar at the slightest opportunity. Delgado, meanwhile, sixth overall and over six minutes down, had long vanished from anyone's predictions. It was a cold, damp day, sleeting at the top of the puertos, the narrow mountain roads gloomy among the dripping pine forests. A puncture on Cotos, the second climb, was the start of Millar's troubles. Two of his team-mates quickly brought him back to the front group, but then dropped away, exhausted. Peugeot hadn't thought to provide him with some decent climbers for support. The puncture was the trigger for an attack by Kelme's stage-hunter Jose Recio, who'd won in Segovia the previous year. When Millar returned to the front group, Ruiz Cabestany realised that he, the Scot, and the Colombian might as well be chained together. Where one went, the others were sure to follow. So he cut Perico loose, thinking his team-mate might at least get a victory in his home town. Delgado jumped and caught up with Recio on Los Leones. At first, the Kelme rider was suspicious of his unwanted companion, but with the encouragement of his director, Rafael Carrasco, the pair began working hard together. Carrasco had glimpsed the possibility of a miracle and yelled out: 'Go on, Perico! There might be a surprise!' It seemed irrelevant that Delgado belonged to another team. His own director, Perurena, was back with Ruiz Cabestany: that way, Millar's suspicions would not be aroused. Then his world shattered: the Peugeot director, Roland Berland, drove up and told him that Recio and Delgado were five minutes up the road, 40 kilometres from the finish. He suddenly realised he was completely isolated, surrounded by enemies. Incredibly, Berland hadn't made any deals beforehand to make up for the limitations of his team, and he was too inept to organise any support now. Afterwards, Millar spoke bitterly against the 15 riders in his group: 'Nobody would ride. They preferred to see me lose and a Spaniard win.' But he was naive to think he had the right to their support. They needed a good reason for working to the detriment of another cyclist. Millar was trapped: with Pacho Rodriquez breathing down his neck, if he pulled the group too hard on his own, he would lay himself open to attack at the end. Always a self-contained man, in defeat Millar felt utterly alone: 'It seemed the whole race had wanted me to lose.' When his group entered Segovia at 6'-50", the crowds were going wild. He took it to heart, forgetting that it was a natural response in Delgado's home town. His sense of humiliation was intense. 'The guys in the pack, they acted sympathetic but I felt they were laughing behind my back.' He sought comfort in conspiracy: 'It was so blatant, so scandalous.' Even RENFE (the Spanish equivalent of British Rail) were accused, with dark rumours of Peugeot riders waiting behind closed level crossings and trains that never came: scenes from a cycling thriller. In all his recriminations, Millar never mentioned Roland Berland. It was an unprecedented outbreak of national unity. The rare chance to overturn the race in such an audacious way had overcome team rivalries, and in the heady atmosphere the directors forgot their personal quarrels for once. Perico's victory belonged to all of them, and for one brief day, they were a big happy family. His euphoric cry of 'My victory is Spain's' caught the mood. After the final stage in Salamanca, won by the Soviet, Vladimir Malakhov, the Spanish Press acknowledged that Millar, the best rider in the race, had been badly let down by his team. Their sympathy was tepid though, partly because of his premature crowing of victory, but mainly because Delgado's snatching of victory had been so irresistibly enjoyable. The international Press were not so enthusiastic, talking scathingly of collusion, but as a footnote, in the Tour de France that year, the blatant assistance given to Hinault by the Colombian Lucho Herrera made the organisers issue a warning to their respective team directors. The complacency among the French journalists prompted Reynold's director Echavarri to protest: 'If you questioned Delgado's victory in the Vuelta because of the collaboration between the Spanish teams, I don't understand why you don't do the same in the case of Hinault and Herrera.' As for Hinault, his reaction to the controversy was to turn up at a Press conference on a motorbike, wearing a traditional Colombian hat. Apart from getting paid a good starting fee by the organisation, they would accept 'offers' from the team of an escaped rider in return for not chasing him down. The system of these strong teams, especially the Dutch, was to only allow solitary breakaways, letting them build up a considerable leeway. These teams, filled with powerful road-men, were so dominant they could close down the escape in the final kilometres unless they found some other 'interest' in the stage. In 1986, Spain (together with Portugal) was at last admitted to the European Community, almost 30 years after Franco's first petition to join the Common Market back in 1957, and although this meant having to struggle with the complexities of VAT, there was a great sense of optimism. At the formal signing of the treaty of accession, the Prime Minister, Felipe Gonzalez, caught the spirit of the moment when he declared that it was an extremely important step for the overwhelming majority of the population, for whom 'the integration of Spain into Europe has been identified with participation in the ideals of liberty, progress and democracy'. As if to reinforce the feeling that Spain was irremediably changing, the first week of the 1986 Vuelta no longer had an exclusively Belgian flavour. The Spanish won two stages in bunch sprints, despite the presence of experienced rivals such as Eddy Planckaert and Sean Kelly. It was the spring of the nuclear meltdown in Chernobyl, and all over Europe the direction of the wind was edgily monitored, a common enough pastime among the Spanish cyclists every year in the Vuelta. Yet when the cross-winds blew up on stage 10, as the peloton descended from the Picos de Europa to the plains of Palencia, the Spanish teams were unperturbed. The main losers in the abanicos that day were the diminutive Colombians. Whether or not he had surmounted his bitterness, Robert Millar was back, with improved support from his new team, Panasonic, and everyone expected another duel with his nemesis Delgado. Although Perico was riding, he was saving himself for the Tour, which he would abandon half-way through when his mother died suddenly from a stroke. Instead, Millar had the bad luck to come up against Alvaro Pino in the form of his life. At the end of the first week, the race had reached Asturias and Millar was looking strong in the yellow jersey after winning the Covadonga stage. Then he was unexpectedly beaten in the uphill time-trial on the Naranco by Pino, who climbed to second overall, eight seconds down on the Scot. Pino was known as a modest rider with a great capacity for suffering, ready to die on his bicycle, as well as liable to burst into floods of tears at emotional moments. One of the few professional cyclists to emerge from Galicia, when he hung up his wheels, he became a very successful team director, famous for establishing an excellent rapport with his cyclists, first in Kelme and more recently in Phonak. Back in '86, Alvaro was in the hands of director Javier Minguez in Zor-BH. In the Valladolid time-trial, after riding as if there were no tomorrow, Pino took 41 seconds out of Millar, who, nevertheless, remained unperturbed. He was biding his time waiting for stage 17, with its summit finish in the Sierra Nevada. He knew it would be the perfect opportunity to win back the yellow jersey, with 30 endless kilometres rising through 1,700 metres. It was a climb for contemplating how fast time can pass - Perico would lose ten minutes. Millar struck early, still with 22 kilometres to go. But hed underestimated Pino and, although Javier Minguez's tactics were sometimes questionable, on this day they worked perfectly. When he lost sight of his rival so far from the finish, Pino momentarily crumpled. It was a propitious moment to call in a favour. A year previously, in the mountains of Segovia, Minguez had held back from defending Pacho Rodriguez's second place. Some saw it as a sacrifice for the nation, but at this crucial moment in the Sierra Nevada, it might have been viewed as an investment paying timely dividends. Without hesitation, Marino Lejarreta of Orbea, winner of the '82 Vuelta after the Arroyo disgrace, put his wheel at Pino's disposal, pacing him until he recovered. Pino maintained a steady distance behind the Scot, who was dismayed to see his rival draw up alongside, four kilometres from the top. 'I attacked too soon,' Millar admitted afterwards, but he smelt conspiracy all around. 'I never had any time references. I don't understand how Pino had the team-car behind him all the while and they didn't let my director through.' Furthermore, the night before, in Jaen, Panasonic had had to switch hotels at the last minute and the one they were allotted had closed its kitchens; the cyclists had been forced to roam the streets in search of a restaurant. The sense of being in enemy territory was compounded by the terrible dinner they were served. Plots apart, deep down Millar must have known he'd wasted his chance: no one denied that he was the best climber. If he'd gradually accelerated the pace, patiently squeezing Pino in a vice, a final attack would have seen the Gallego drop like a ripe plum. The few misguided patriots who thought they were witnessing another united front of Spaniards against the foreigners were disappointed. Two days later on the stage to Puerto Real, near Cadiz, the peloton split, with Millar and Orbea's Lejarreta and Cabestany stranded behind, while Pino was in the front group. The TV commentators spluttered with rage when Orbea collaborated with Panasonic to close the gap. They seemed unable to grasp that the closing of ranks in '85 had occurred in exceptional circumstances, any more than they understood that the Vuelta's international standing would suffer if this were to become a pattern for the future. Pino, entranced by the Andalucian spectators waving pine branches at the roadsides, was overwhelmed when three coachloads of supporters from Galicia arrived in Jerez to see him hold up the Vuelta trophy. Millar was second, again, and on the bottom step was Sean Kelly, showing how far he'd progressed to be sharing a podium with two climbers, especially as he'd begun the Vuelta suffering from tendinitis. He was going to come back even stronger in 1987, when he'd fight the essential duel of the race with the Colombian Lucho Herrera.